Justin’s note: For our weekend edition of the Dispatch, we turn to International Speculator editor David Forest, whose team has conducted a unique study on which resources are the best stores of value – and the best bets to profit on – before, during, and after a crisis. The blue line you see is the 10-year yield minus the 3-month yield. 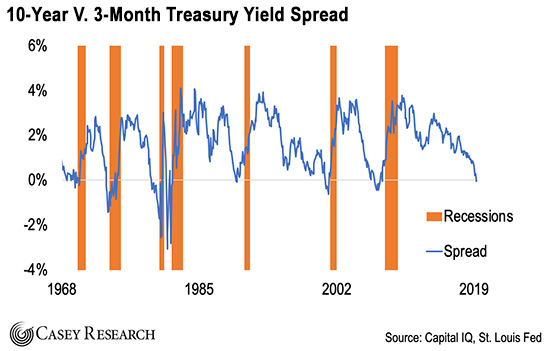 The orange bars represent the recessions which followed after the yield curve inverted. It shows that short-term bonds have a higher yield than long-term bonds with the same credit quality. Without getting too technical, the thing to remember is that an inverted yield curve can tip you off to impending softness in the economy. On average, the market collapsed just eight months after this indicator dipped below zero. This time is unlikely to be different. 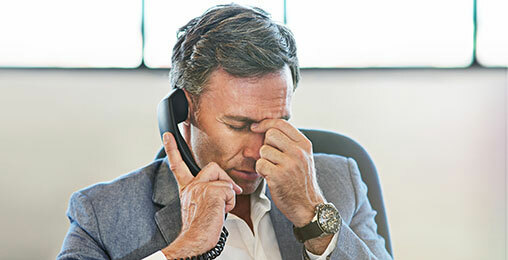 This may sound gloomy – and certainly part of the strategy in preparing for a bear market or a crash involves positioning to protect your wealth from big losses. But I’m also interested in the opportunities for major profits that might come in commodities as a result of a breakdown in the financial system. And it’s the potential for such gains that makes a coming financial crash a little less frightening – and maybe even something to look forward to. Is This Making Tesla Nervous? It seems Tesla is getting very nervous. According to CNBC, some customers were left “waiting for months” to get their refund. But also render all 3.1 million electric vehicles on the road today, obsolete. And the few investors who see it coming could make an absolute fortune. So how exactly should we protect ourselves and profit if another crash emerges? To find out, let’s look at how different metals have performed in past crises. My team and I put together this data – not just for the 2008 crash, but including the last four major financial crises: the Japan meltdown (1990-1992), the Asian financial crisis (1997-1998), the dot-com bubble (2000-2002), and the Great Financial Crisis (2007-2009). This showed us a few things. First, it showed which metals did well in the boom time just before a crisis (and which metals are thus leading indicators of a coming crash). Second, it showed which metals were the best store of value during investor panic. Third, it showed which metals are best to buy at the depths of a crisis in order to profit from the recovery that’s historically taken place the year following a crash. 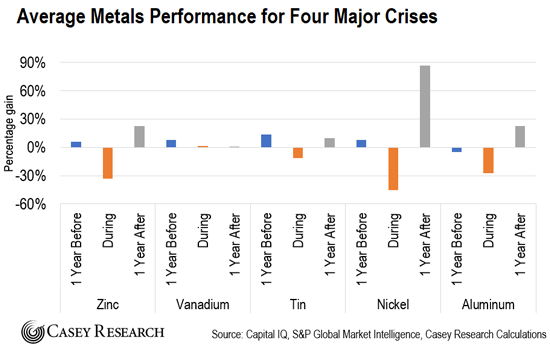 Here’s how that picture looks… Below is the average performance for our 10 metals during the last four big crises. Let’s go through some of the specific takeaways. Base metals can get hit hard during tough economic times. The data back this up – during the last four crashes, the worst-performing metals have been aluminum, copper, zinc, and nickel. On average, these major base metals fell 25-45% during market panics. This makes sense, given these metals are tied to industrial activity. 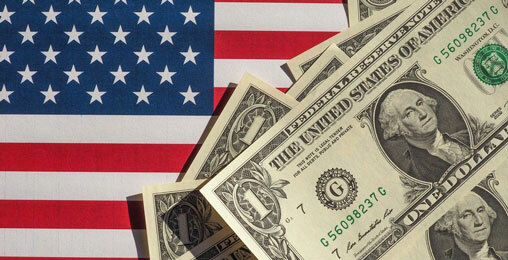 When the economy hits major speed bumps, investors dump these first. The major base metals are also increasingly traded by speculative investors worldwide – and when markets get wiped out, speculative positions get liquidated. The major base metals do deliver slight gains before a crash. But they really shine afterward. In the year following major crashes, standout nickel gained an average 87%. Copper and zinc showed average one-year gains of 29% and 22%, respectively. Investment Takeaway: When markets are exposed to a significant correction or crash – like today – be very selective with exposure to the major base metals. The best strategy is to buy base metals firms that also hold significant precious metals. If the markets do correct, adding base metals stocks at the bottom to benefit from the immediate rebound is a time-tested, winning strategy. One of the most interesting findings from our research: Minor base metals held up surprisingly well during crashes. 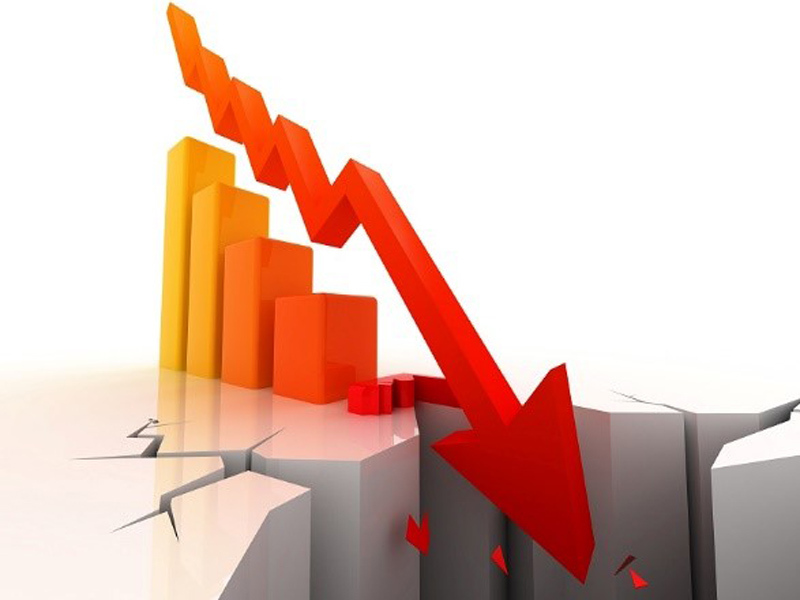 Unlike the major base metals, which fell 25-45%, tin only dropped an average 12% during crashes – which was a better performance than precious metals silver, platinum, and palladium. Vanadium actually posted a 1% average gain during crashes. Both tin and vanadium delivered solid gains in the year prior to crises. In fact, tin was the best performer among all the base metals in pre-crash years, posting an average 14% gain. Investment Takeaway: The minor base metals are good bets for the current unsteady market environment. Both tend to do well in the period leading up to a crash – and even if the bottom falls out of the market, these metals retain value. A major reason they’ve historically held up well in crashes is that there’s been little speculative trading in the minor metals. But a point of caution: That’s changed in recent years. Financiers have created investment vehicles like exchange-traded funds to facilitate wider investment in minor metals – especially those related to electric vehicle batteries. That increasing speculative investment could make minor metals more volatile during crashes than we’ve seen previously. Our research proves that gold is the way to go during uncertain times. During the last four major financial crises, gold was the only metal that increased in value during a crash (aside from minor metal vanadium), gaining an average 3%. The yellow metal also delivered gains before and after the crashes – rising an average 4% in the year prior to a crash, and 10% in the year after. Interestingly, silver fared much worse during crashes. Silver took a significant hit during the crises, falling an average 13%… and barely showed any gains in the years leading up to major crashes. Here’s an even more intriguing finding: Platinum and palladium have been by far the best performers during periods leading up to a crash. 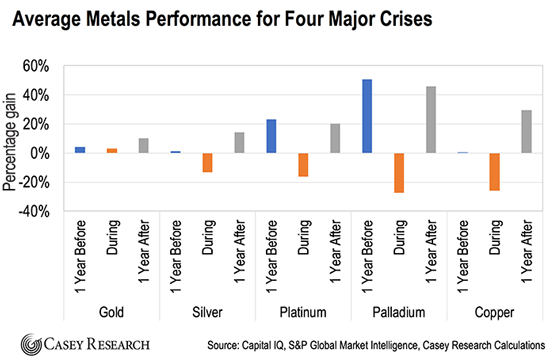 On average, platinum gained 23% in the year prior to financial crashes, while palladium rose an astounding 51% – making these two metals the best performers across the entire metals complex in pre-crisis periods. Investment Takeaway: Gold is the safest place to be in uncertain times – having a history of holding value well and delivering solid gains. History shows us silver isn’t as reliable. Perhaps because of its industrial uses, silver tends to take a much larger hit during crashes. It does rebound well after the storm clears, so best to wait until a bottom in order to take positions. Platinum and palladium are good places to be during the turbulent times leading up to a crash, having historically delivered the strongest gains of any metals during the year preceding financial crises. P.S. Keep this essay nearby… and shift your portfolio according to the historical performance of these metals as the market changes. And there’s another strategic metal that I’m excited about… one that could multiply early investors’ money 64 times over. I’ve identified the three best miners set to profit from $33.7 billion in new demands from Homeland Security. To learn more about this obscure metal – and get in before the huge run-up – go here. What are your thoughts on Dave Forest’s research on the historical performance of these metals during times of crisis? Are you considering investing in them today? Tell us at [email protected].